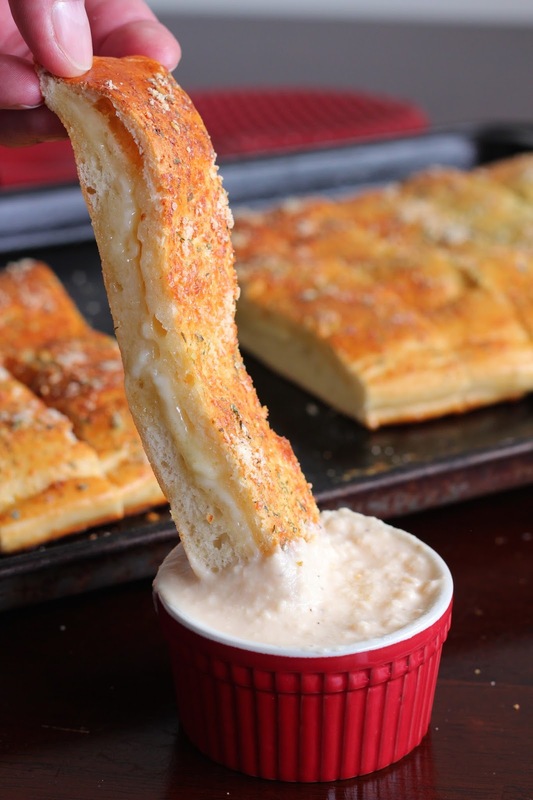 Do you love breadsticks as much as I do? This is a MUST TRY recipe. 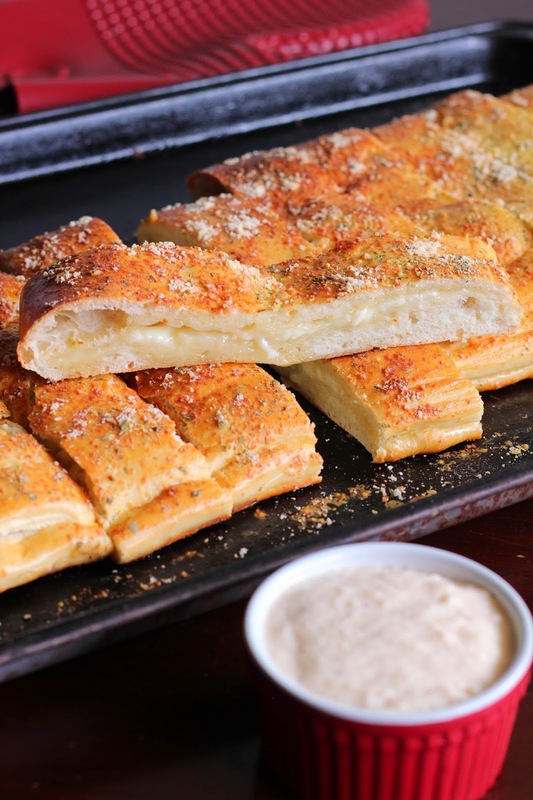 These cheesy stuffed breadsticks are loaded with flavor and the texture is just right. They are so good that you will be thinking about them constantly until the next time you get to eat them. The good news is, they are so easy to make thanks to Rhodes Rolls. I stuffed mine with Monterey cheese, because I love the flavor and it melts beautifully. You can easily use your favorite cheese . 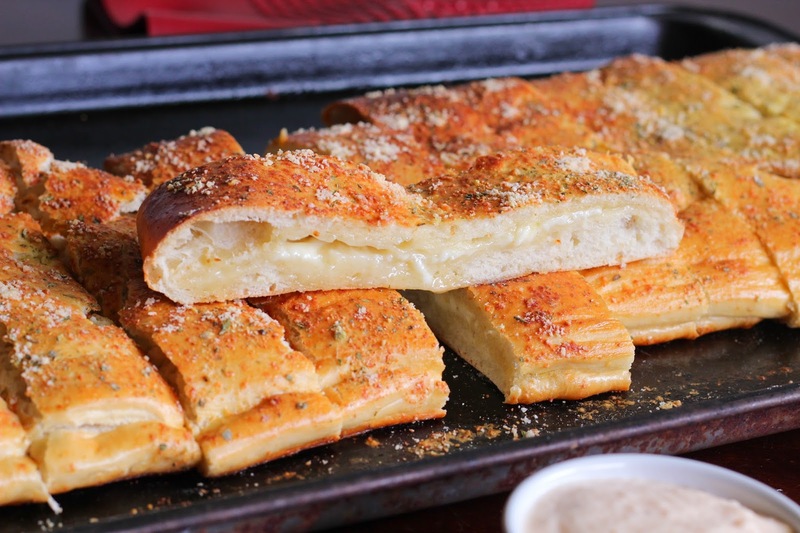 . . Mozzarella, Cheddar or Pepper Jack would all be fantastic. 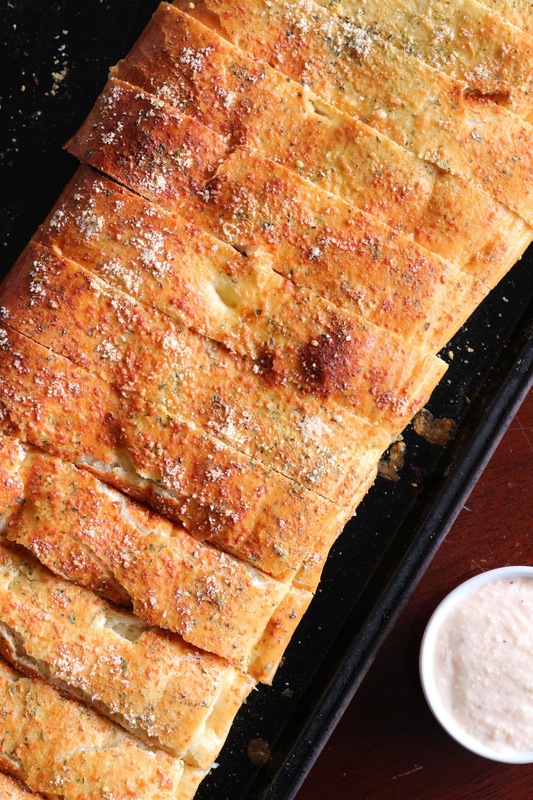 Top with Parmesan cheese and a garlic seasoning blend for even more flavor. If you can't find a garlic seasoning blend, just use garlic powder. This time, I served them dipped in Alfredo sauce, but really . . . they are good plain, served with spaghetti or any pasta or pizza. I can't wait to try them dipped in soup. Honestly, I will gladly eat these with every meal no matter what it is :) You will savor each and every bite. Let me show you how easy they are to make. First, combine all 20 thawed rolls and form into a large ball. 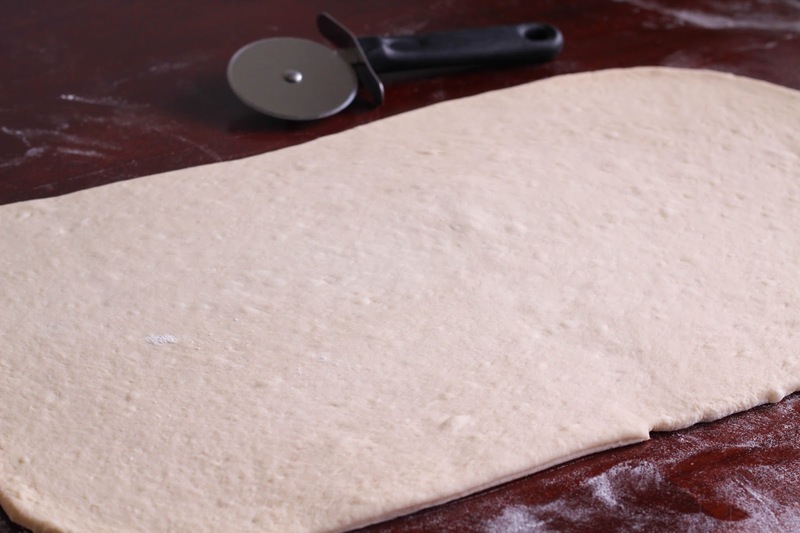 Roll out onto a lightly floured surface. Cut uneven edges with a pizza cutter, so you have a rectangle. 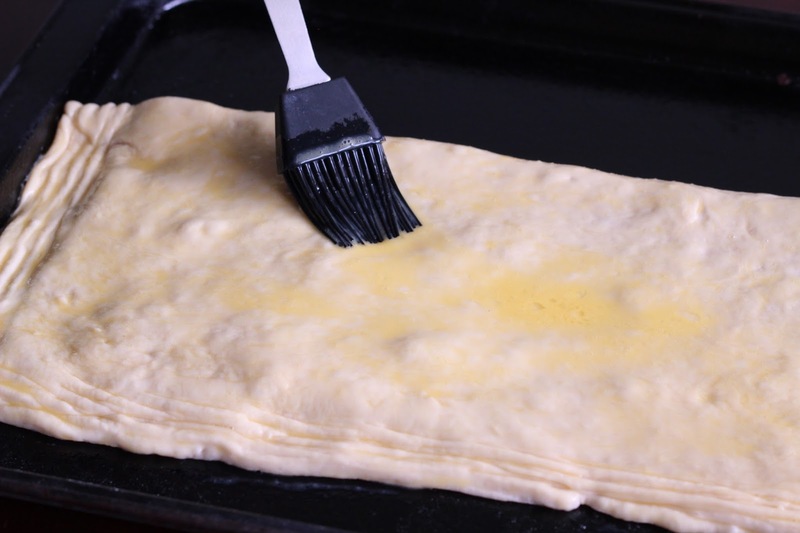 Transfer dough to a large baking sheet. Make sure the baking sheet is as big as your rectangle or you will have to trim the dough to make it fit. 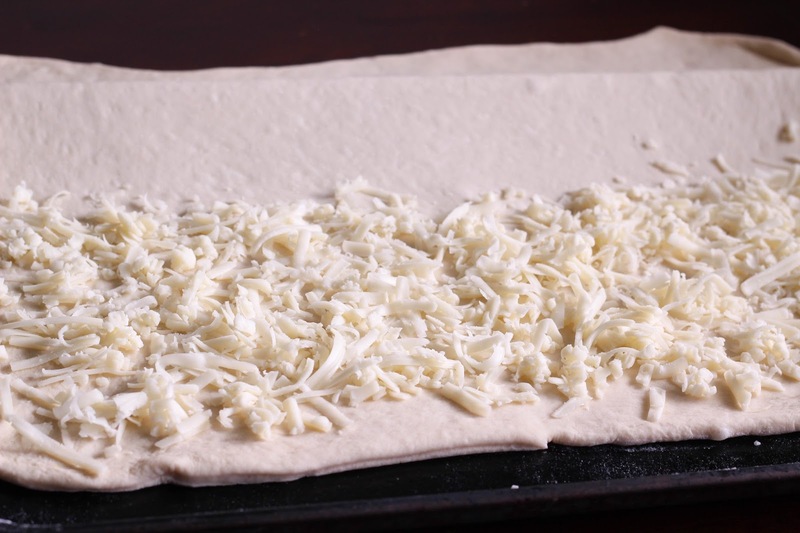 Top bottom half of dough with grated cheese. Fold top half of dough over and pinch edges with a fork to seal. Brush top with a beaten egg. 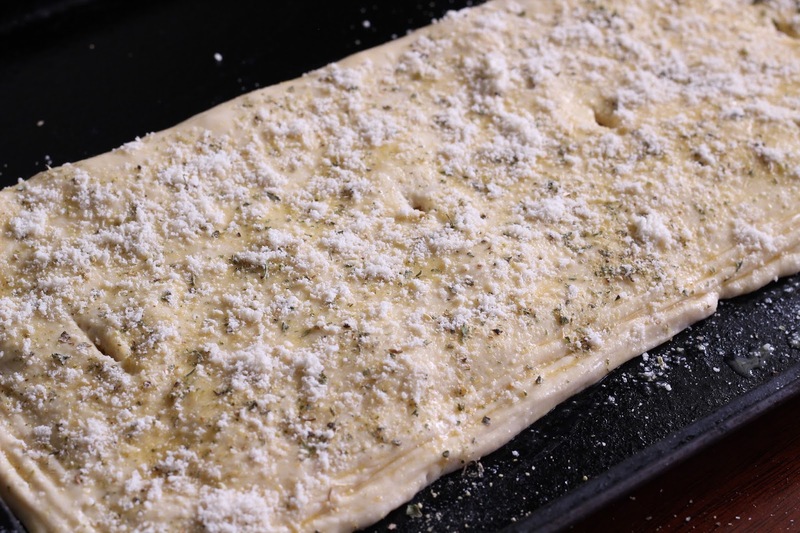 Sprinkle with garlic seasoning and grated Parmesan cheese. Cut several slits on top of the dough for ventilation. This will keep it from puffing up while in the oven. Bake until golden brown. Slice and serve. Today, I served mine with Alfredo sauce and it was incredible. I am sharing this amazing recipe over at Rhodes Blog today. Click HERE to get this must-have RECIPE. This post is sponsored by Rhodes Bread. All opinions are my own and I have always been a fan of Rhodes. Thanks for allowing me to work with the brands that I love.